It is well documented that children on the Autism Spectrum have lower then average melatonin levels. Melatonin is a major hormone that is secreted by the pineal gland and controls both sleep and wake cycles. When this is low or suppressed then you will have a child who either has issues falling asleep, staying asleep, or having a well rested sleep.Like many of you with children on the spectrum you may very well be dealing with the night time meltdowns and the sleep issue as do we. Flashback to about 5 months ago I never really knew much about melatonin all I knew is that the Monkey had a very hard time turning his brain off at night to allow him to fall asleep without having a meltdown of 1 or more hours. He is a very anxious little boy who needs to know exactly what is going to happen in his life at all times. At bedtime he would start cycling through all his thoughts, asking us the same questions over and over and getting very upset when these questions were not answered the way he wanted or if they were ignored. After living through this every night and my husband and I nearly losing it Rebecca suggested trying melatonin supplementation with the Monkey. The first night that we tried it I was actually out with friends but the hubby said within 30 min he was so tired he went straight to bed without a fuss. It didn’t fully get rid of the nightly meltdowns but on the nights that he still had them they only lasted 30 min tops which is a far cry from the 1 – 2 hours that we were listening to him scream before. With this though he was still waking up early to ask all those pressing questions and we traded our nightly meltdowns for morning ones. I started researching about sleep issues in children and about melatonin and I came across some interesting findings. I found research to suggest that the nightlight we had been using in the Monkeys room since the day he was born could actually be doing him more harm then good and actually suppressing melatonin. It has been shown that nighttime light exposure, especially from blue light, suppresses the production of melatonin therefore if you are already low in melatonin to begin with then I would assume that these things can only make everything worse. Sleeplessness, like Rebecca’s post about melatonin highlighted, can cause some serious negative health affects. Now I wont go into the science of this here but if you want to read more on how blue light negatively can affect you and why go here or here. With this new found knowledge and a Monkey that will only sleep with a light on in his room I first started to try and limit that exposure. We started with a smaller, slightly dimmer nightlight, and then slowly we were finally able to leave his door open but have no light in his room at all. The difference in his sleep pattern and moods was astounding. He was waking up happy most mornings, he was sleeping till around 6:30 sometimes later and he was staying asleep. All was going great and then he got sick. Hurray for us! Now he wanted the big nightlight on all the time again and all the old sleep issues came back. He was waking up in the middle of the night, coming in to wake us at 5am and we, as a family, just could not go back to living this way. I decided to try and find a light option that wouldn’t affect melatonin. All research that I had read suggested that although all light is bad that blue light was in fact the worst and like you may have read in the other link I shared up above amber or red lights are a much better option. You can read about the science on that here. So we decided that we had to find a red light and see if this would solve the issue. We ended up buying a light like this one and we put it into his bedroom lamp. We decided there was no harm in trying to see if this would work. The Monkey actually really liked the red light and how it made his room look which was a plus for us as I had honestly feared that we would have had to work on transitioning him into the new colour. 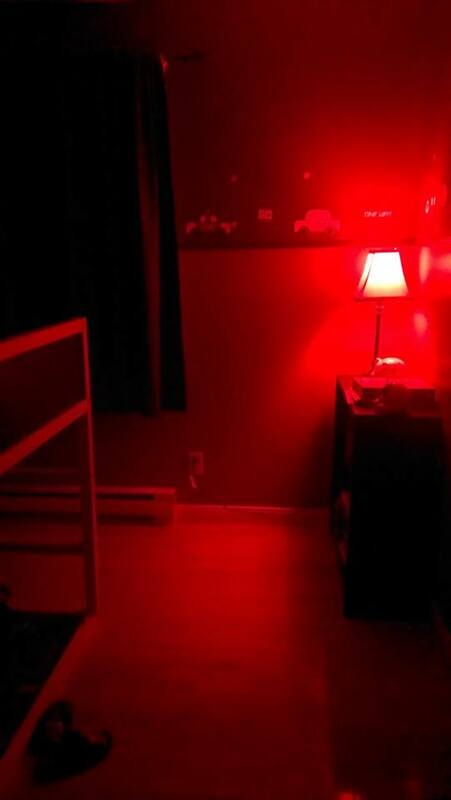 The first night we used the red light instead of his regular nightlight he slept in till 7am. It was like I heard angles singing to me. Since using the light he has been waking up happy for most days and sleeping well past 6:30 every morning. Even his workers commented that they found him to be much more present in therapy and chipper. I think this is amazing and with such positive changes we’ll be using a red light in his room until he can fully sleep with no light at all. So here is my question to you. Do you use a nightlight with your children? Do you use melatonin and still have sleep issues? If so you could always try a red light and see if it makes a difference. UPDATE: We (Rebecca) use the red light (although we found the little pink nightlight that gives off a red glow) with MJ as well as melatonin and have found it has made a world of difference. Her sleep quality and length of sleep time has increased yet again for 4-6 of the 7 days in a week. This is up from the 3-4 with melatonin alone. I’ll take that any day.